NinJump DX Game Review | Johns iPhone | iPhone Blog with Help, News, Tutorials, Tricks, Tips, and More! New game for y’all iPhone and iPod Touch gamers. NinJump DX was introduced to me by my lil’ brother, Alex! 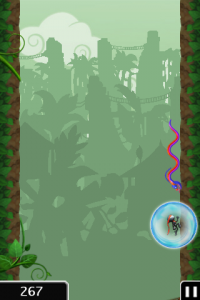 NinJump involves a ninja who is running nonstop up the left and right walls of various locations. 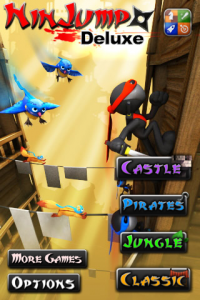 As the ninja runs up the walls he is met by cannons being fired across his path, birds, pirates, squirrels, ninja stars an a few other objects that are trying to stop you from gaining a high score. A little plus to the game is the fact that if you knock 3 of the same items out of the middle of the air then that item will give you a boost and fling you a great distance to give you help with achieving your high score. The app is available for $.99 in the app store and is a great game to help pass the time. Hope you enjoy! Leave a comment on how you like the game also leave suggestions of games you would like us to try and review for you before you get them!